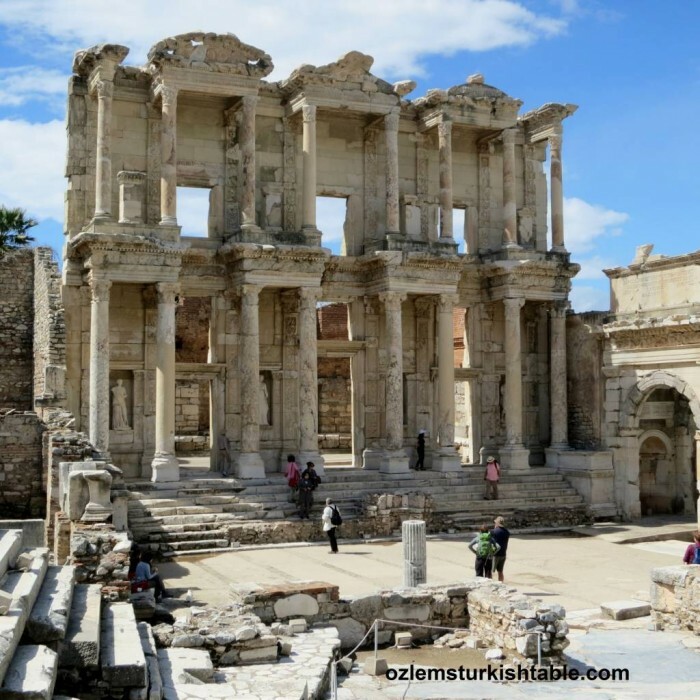 I have recently watched this wonderful video on the beautiful Izmir region; Ephesus, the turquoise Aegean Sea, inviting Turkish food, friendly locals to welcome you; video said “life is worth exploration; so much to experience, see, taste…” How very true. 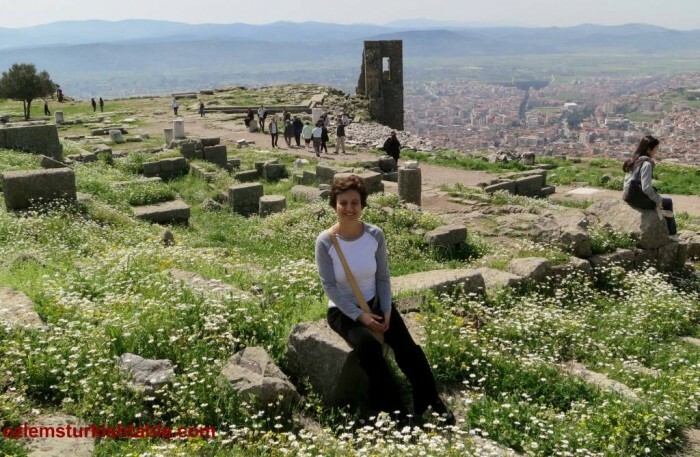 This has been the basis of my culinary and cultural tours to Turkey; a fascinating land with warm people, so worth exploring. 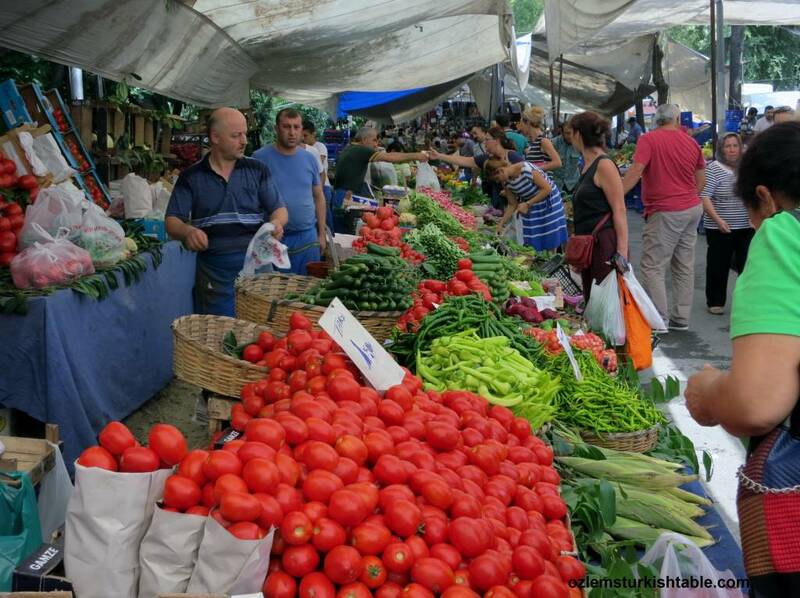 I have been organizing and hosting small scale Culinary and Cultural Tours to Turkey for 8 years, aiming to show my homeland from a local’s perspective. This is the land I belong and love; a special land packed with history, traditions, beautiful landscape, fabulous Turkish food and wonderful, friendly locals. 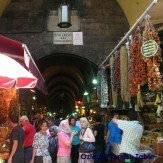 Here, I am delighted to present you my 2 upcoming Fascinating Turkey Culinary & Cultural Tours to Turkey. First one from Saturday, May 23rd 2015 through Saturday, May 30th 2015, second one from Saturday, October 24th through Saturday 31st October 2015. We have a very exciting itinerary, covering off the beaten track sights, experiencing foodie heaven markets like the Kadikoy Market in Istanbul, private boat tour along the Bosphorus, Whirling dervish shows, exploring old and new parts of Istanbul to give you a real feel of this fascinating city. 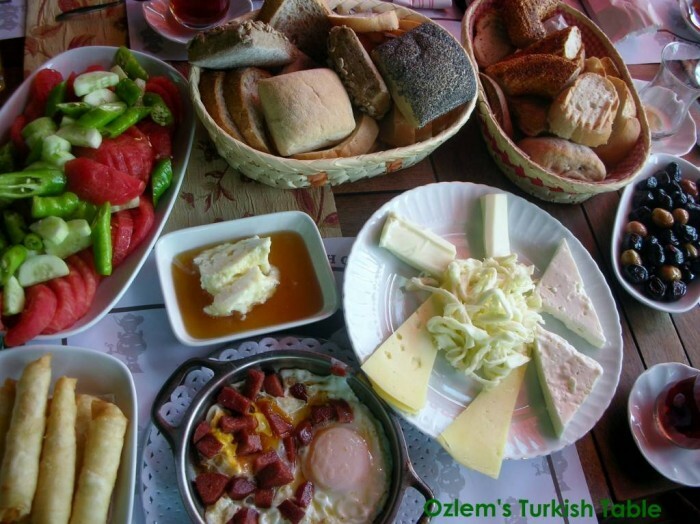 And food, the glorious Turkish food; starting from my favorite meal of the day Turkish breakfast, every meal will be authentic and memorable. We will learn all about Turkish spices, Turkish coffee, Turkish Delight and stock up the finest examples of them at the Spice Market, Istanbul. During our tour, we will have 3 Turkish cooking classes to explore regional cuisines – in Istanbul, Cappadocia and at the charming village Sirince, to learn about the hearty Anatolian cuisine and the Aegean cuisine, using region’s wonderful olive oil and fresh produce. 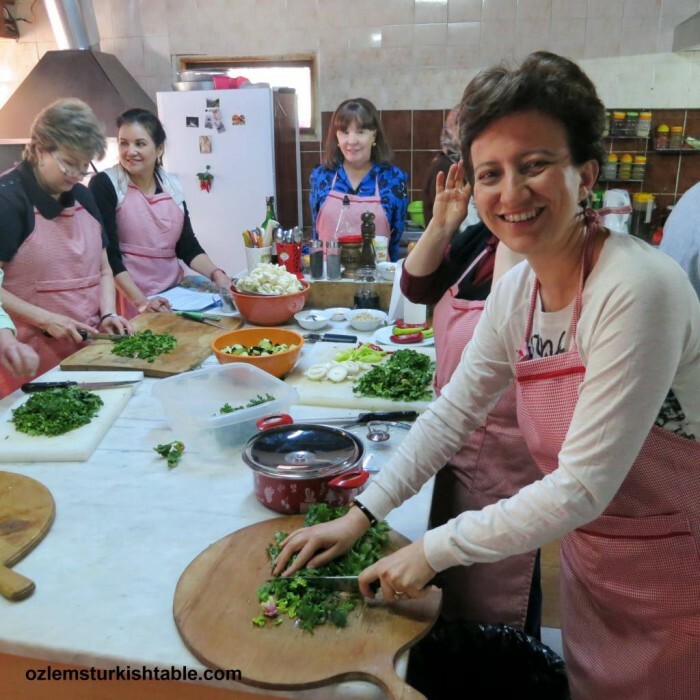 In Cappadocia, we will be treated to a special local Turkish cookery class by the village ladies in a traditional Cappadocian home, an experience I greatly look forward to. Cappadocia Region, the land of fairy chimneys will be a special highlight. 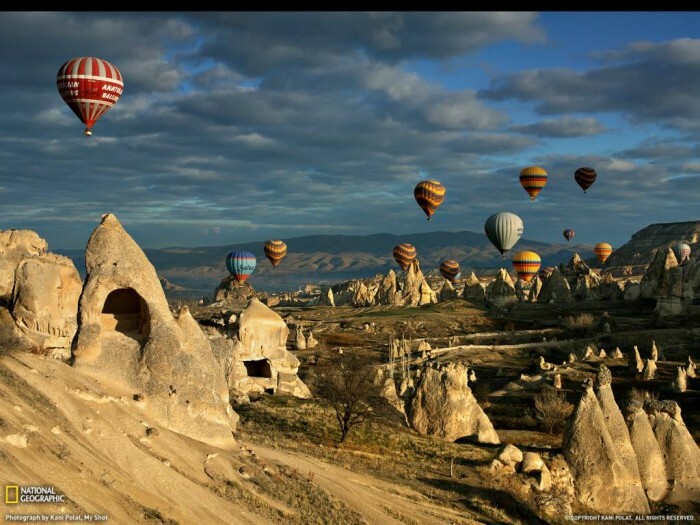 Exploring Goreme Underground City, optional Hot air balloon over the fairy chimneys, visiting a local Turkish Ceramic Art Shop to learn how the world famous tiles and ceramics made and watch masters working and many more – all to look forward to. And then beautiful Izmir region to follow; charming Sirince Village for our hands on Turkish cookery class, learn about the delicious and healthy Aegean cuisine; visits to the fascinating, ancient Greco –Roman city, Ephesus and Virgin Mary’s house. 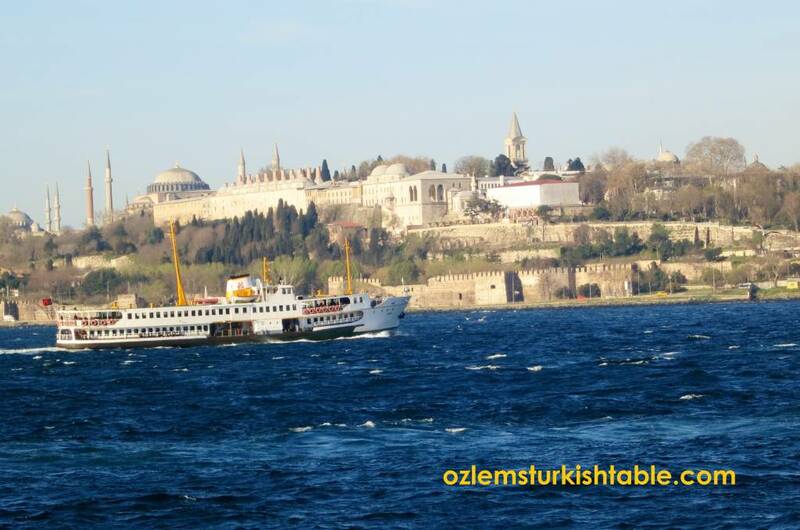 Here is my Fascinating Turkey 2015; Culinary & Cultural Tour Brochure with the Registration Form. The tour is limited to 15 participants only and the registration started. Please kindly Contact me if you have any questions or would like to sign up for our tour. The Willie Nelson song sums it all up for me –“On the road again; just can’t wait to get on the road again!” I really can’t wait and I hope you can join us too. This Kiymali Pide, Turkish flat bread with ground meat and vegetables filling, is one of the most popular snacks and our slow cooked “fast food” in Turkey. In Rural Anatolia and at my home town Antakya, locals would prepare the filling and take it to their local bakery, firin, to be baked into delicious flatbreads with this topping over. 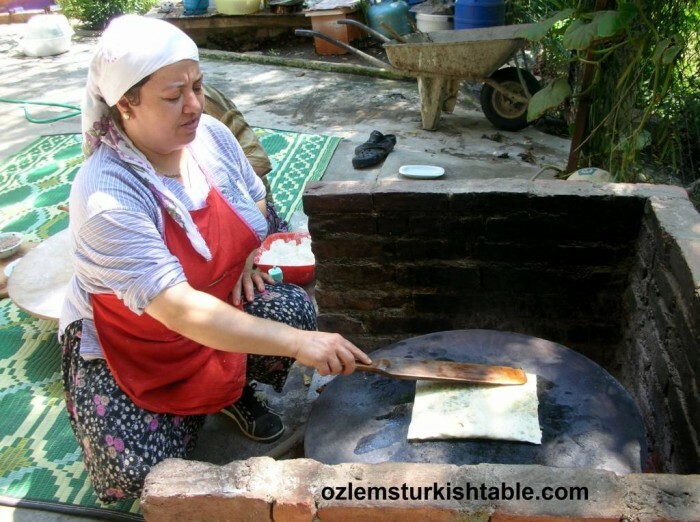 There are also “Pideci” Turkish flat bread shops that solely bake and serve these flat breads along with piyaz or Coban Salata, Shepherd’s Salad; such delicious flavor combinations. Traditional bakery, firin in Antakya. 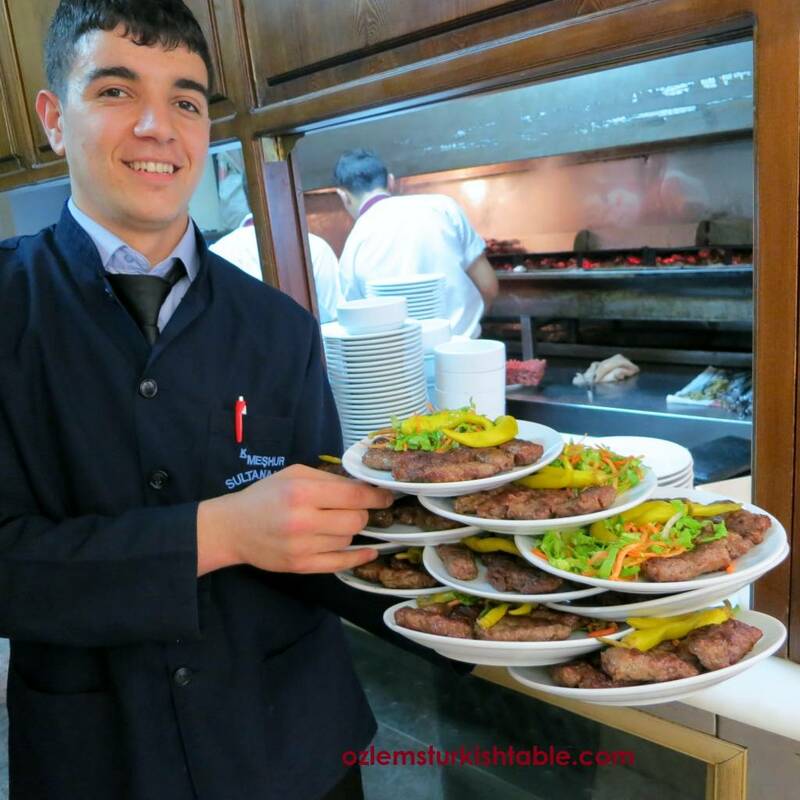 Bakers not only bake the bread but also flat breads with toppings that customers would bring. I am often asked the difference between pide and lahmacun, another national favorite. Lahmacun is also a flat bread with ground meat topping, but it is thinner and in round shape. We like to squeeze lemon over it liberally and roll it like a wrap to eat lahmacun. Pide is oval in shape, thicker and we serve in slices. Shaping the flat breads; it is easier to spread the filling while the oval flat bread is on the tray. Pide can also be made in various toppings; some favorite toppings are ground meat & onion, Turkish kasar (cheddar) cheese & spinach, cheese and pastrami (Turkish dried beef), cheese and Turkish spicy sauage (sucuk). 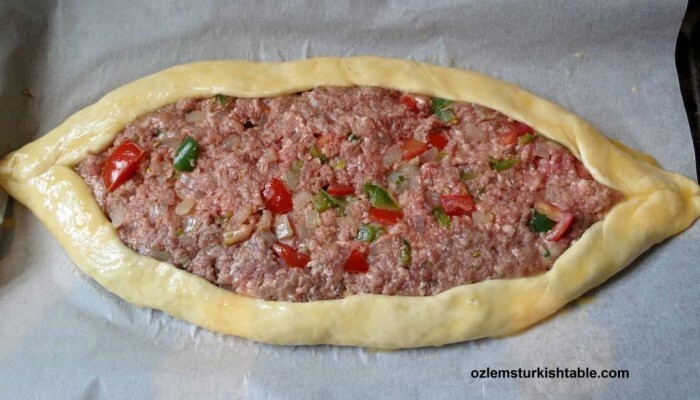 Sometimes an egg or two can be cracked over pide towards the end of baking too, as in some examples of Karadeniz Pidesi a specialty of a pide prepared in Black Sea region. Making pide is actually much easier than you think – we made it at my recent Turkish cookery class and it was a big hit. I hope you enjoy this delicious Turkish specialty, our version of pizza, packed with flavor and have a chance to recreate at home. 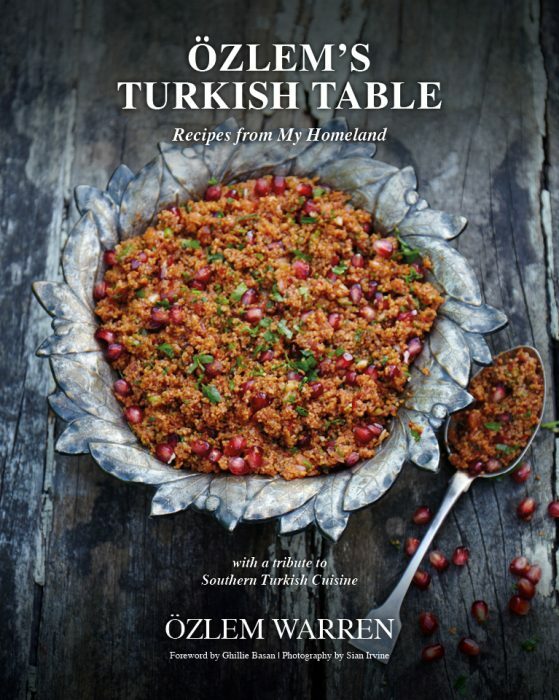 Both vegetarian pide and with minced/ground meat topping are included at my Turkish cookery book, Ozlem’s Turkish Table, Recipes from My Homeland, available to order at this link. 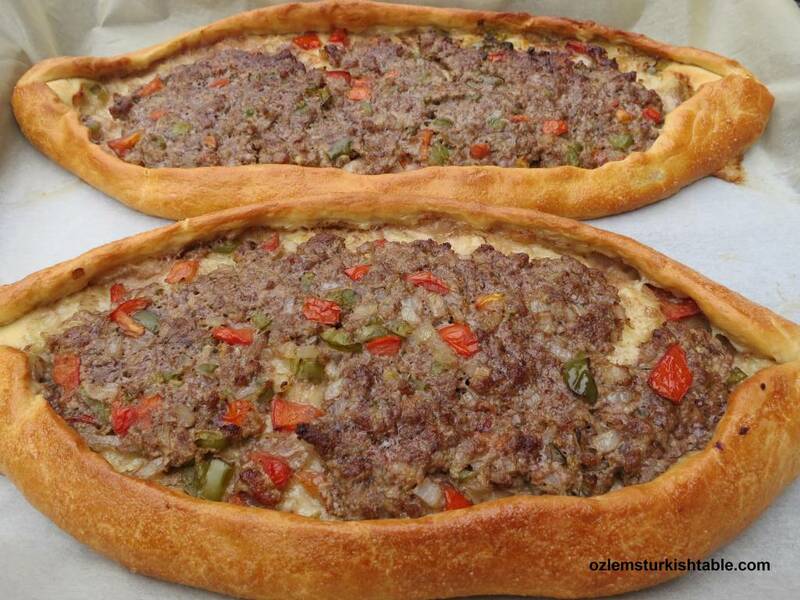 Kiymali Pide, sliced Turkish flat breads with ground meat topping, ready to serve. 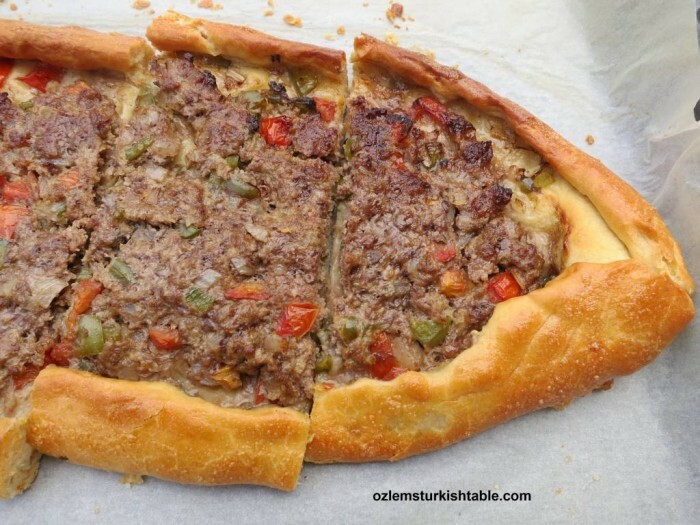 This Kiymali Pide, Turkish flat bread with ground meat and vegetables topping, is one of the most popular snacks and our slow cooked “fast food” in Turkey. In Rural Anatolia and at my home town Antakya, locals would prepare the filling and take it to their local bakery, firin, to be baked as these delicious flat breads with toppings. 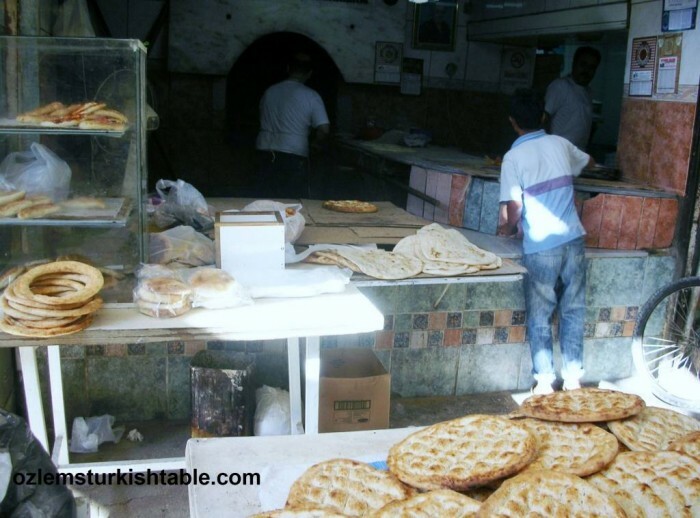 There are also “Pideci” Turkish flat bread shops that solely bake and serve these flat breads. 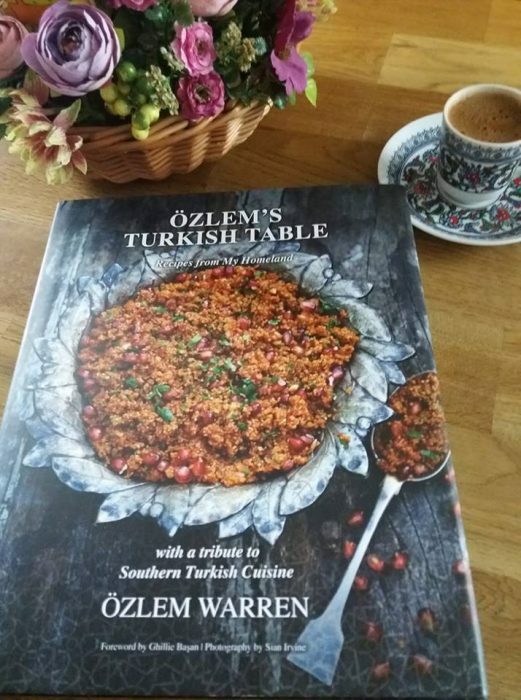 I hope you enjoy this delicious Turkish specialty, our version of pizza, packed with flavor and have a chance to recreate at home. Stir in the dried yeast in a small bowl and pour in ½ cup warm water. Dissolve the yeast in water, mixing with your fingers. Set aside for the yeast mixture to get frothy for 5 minutes. Make a well in the middle and pour in 2 tbsp. olive oil and the yeast mixture. Pour in the remaining ½ warm water to the flour mixture. Using your hands, draw in the flour from the sides and work the mixture into a dough. Knead for 3 -5 minutes, until you reach a soft, smooth dough. The dough gets sticky as you knead, so pour the remaining 1 tbsp. olive oil and stir in additional 2 tbsp. flour to help shape into a soft dough. Place the dough in large bowl and cover with a cling film. Leave it in a warm place for 1 hour; it will be doubled in size. In the meantime, prepare your filling. Heat 15ml/1tbsp. olive oil in a wide heavy pan and stir in the onions and peppers. Sauté the onions and peppers for 2-3 minutes over medium heat, until they start to soften. Stir in the tomatoes and sauté for another 2 minutes. Pour in the lemon juice and season with salt and ground black pepper. Turn the heat off. 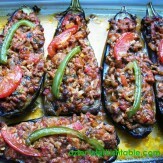 Place the ground meat in a bowl and combine the cooked vegetables with the ground meat, mix well. The topping is ready. Once the dough is risen, place the dough on a lightly floured surface. Knead the dough for a minute then divide the dough into two pieces and roll into two balls. On a lightly floured surface, roll the dough balls into 2 oval shapes of 20 cm x 40 cm (about 8”x16”), with ½ cm (0.2”) thickness. Line a large baking tray with baking paper and place the 2 oval flat bread dough on the tray. Spread the filling evenly over the 2 flat breads, leaving 2 cm at the edges as a border with no filling (it is easier to spread the filling while the oval flat bread is in the tray). Fold in the sides to act as border to keep the filling intact. Squeeze the oval dough at each end to make it pointy. Beat an egg in a small bowl and mix it with 1 tbsp. olive oil. Brush the edges of dough with this mixture. Bake for 25 - 30 minutes, until the pides are golden brown and crispy at the edges. baklava with pistachios, walnuts – even with chocolate! 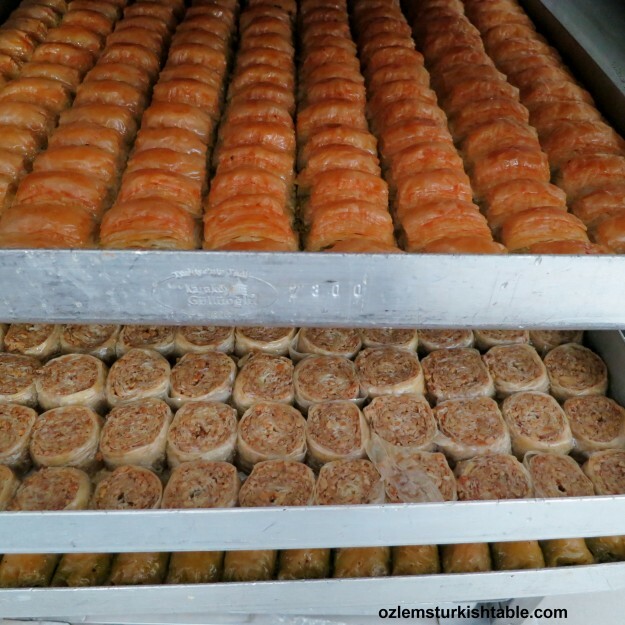 Baklava remains as one of the most popular desserts for most of us and we were delighted to have a chance to observe how the real thing is made during our culinary tour in Istanbul, back in April. 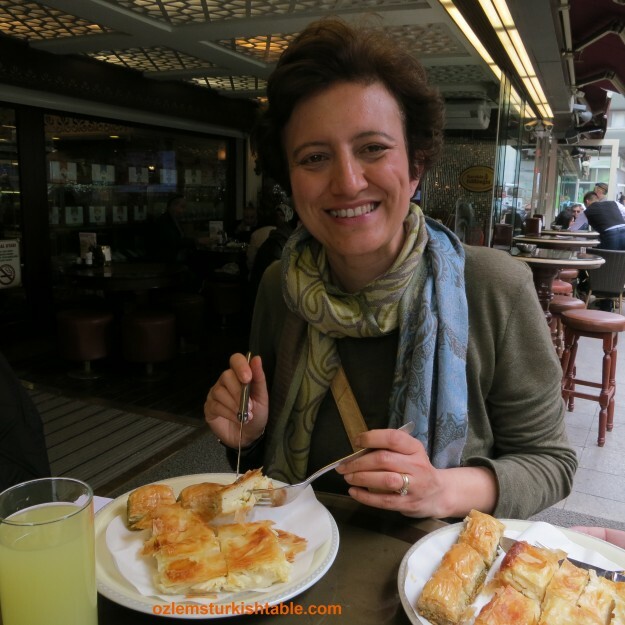 Our destination was Gulluoglu Baklava in Karakoy, the master of baklava makers since 1800’s. Hundred years of tradition; baklava masters, ustas, perfecting their art. 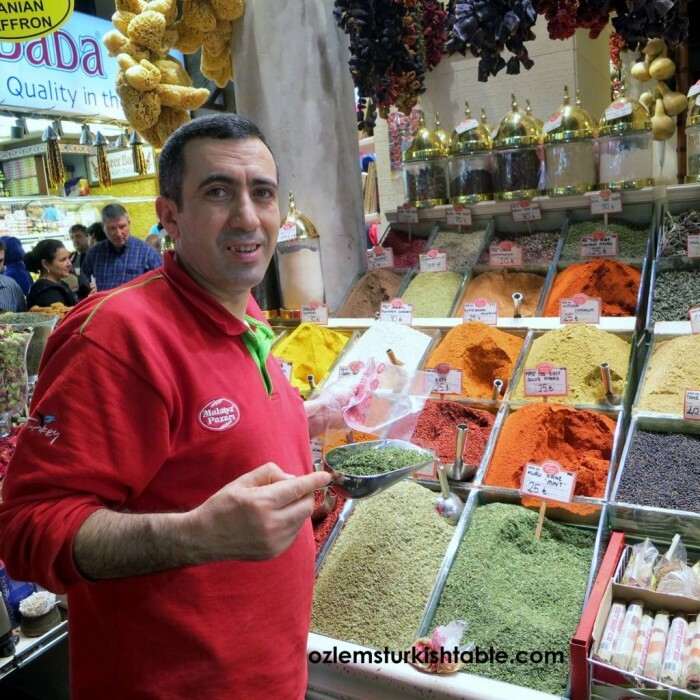 Karakoy Gulluoglu runs baklava demonstration sessions at their factory in Karakoy and watching the ustas, masters of baklava in action, is an unforgettable experience. 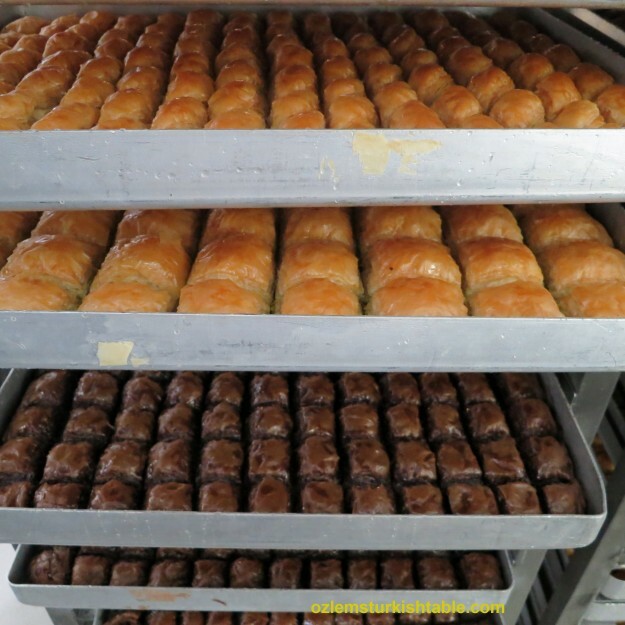 When I say Masters, I mean it; each of the Ustas, Masters, spend 8-10 years at each phase of baklava making to perfect it; rolling the dough; turning the dough into the paper thin sheets of pastry, making the syrup, baking at the right heat.. 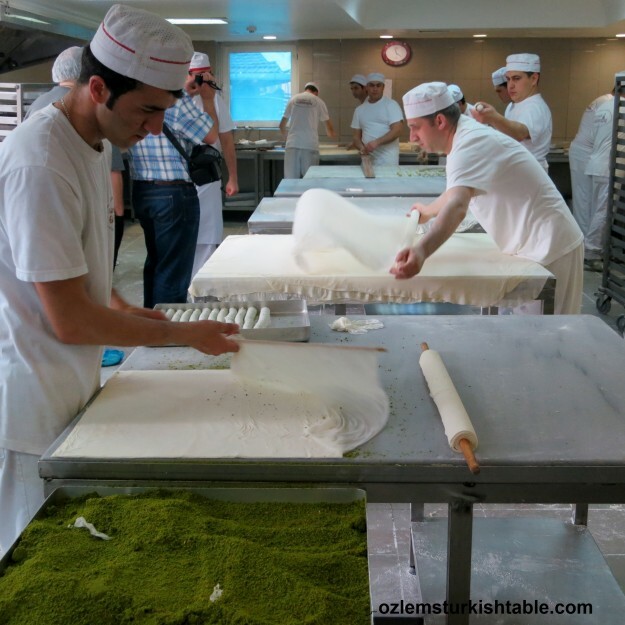 The very first thing that greets you here is the clouds of flour in the air to make that paper thin sheets of pastry for baklava, all “opened”, stretched by hand with an oklava, rolling pin. Once the pastry is paper thin (2mm width), the Ustas, masters, start layering them on a buttered tray. The hand rolled pastry is so thin that you can read the newspaper article behind the pastry sheet. 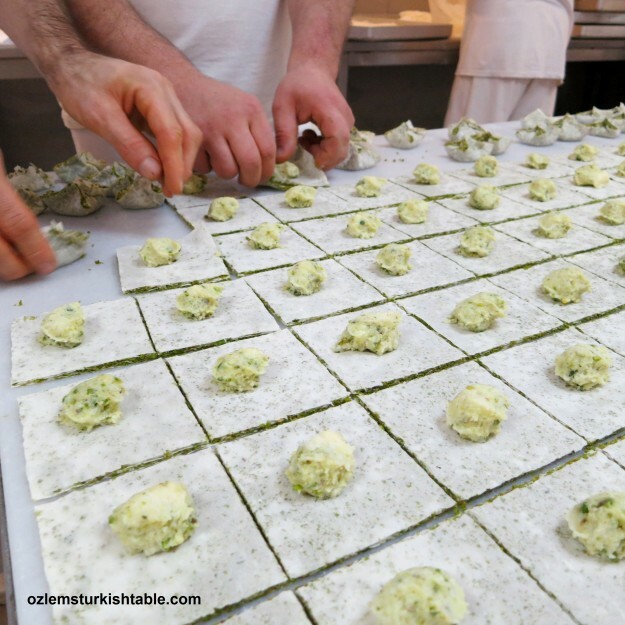 Emerald colored finest Gaziantep pistachios spread generously on the baklava sheet. 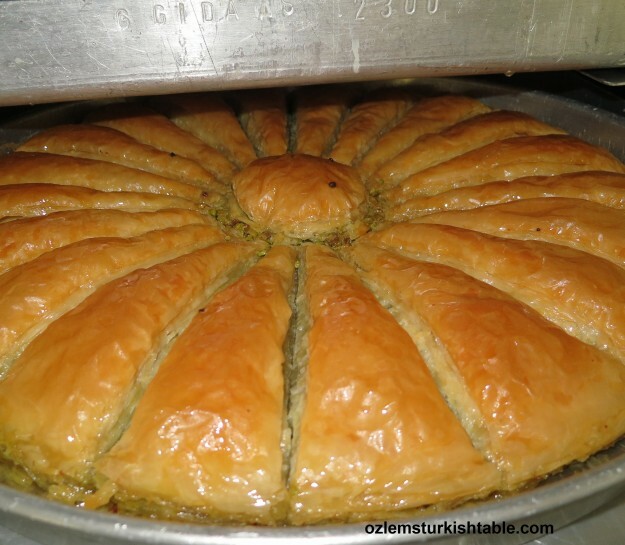 The baklava master layers 20 sheets of pastry ( and sprinkles melted butter on every 4 sheets) then generously spreads finely crushed Gaziantep pistachios – finest and only type used at baklava here- (or at some cases walnuts) on the 20th layer. Once the next 20 layers of sheets added on top, the master, usta cuts the sheets first horizontally and pours melted butter over them – cutting helps the butter to penetrate every level. He then cuts vertically and splashes another dose of melted butter all around. The baklava is now ready to be baked in the oven at 165 C – 330 F.
We also had a go at baklava pockets with clotted cream and pistachios; kaymakli, fistikli gelin bohcasi, another amazing treat. 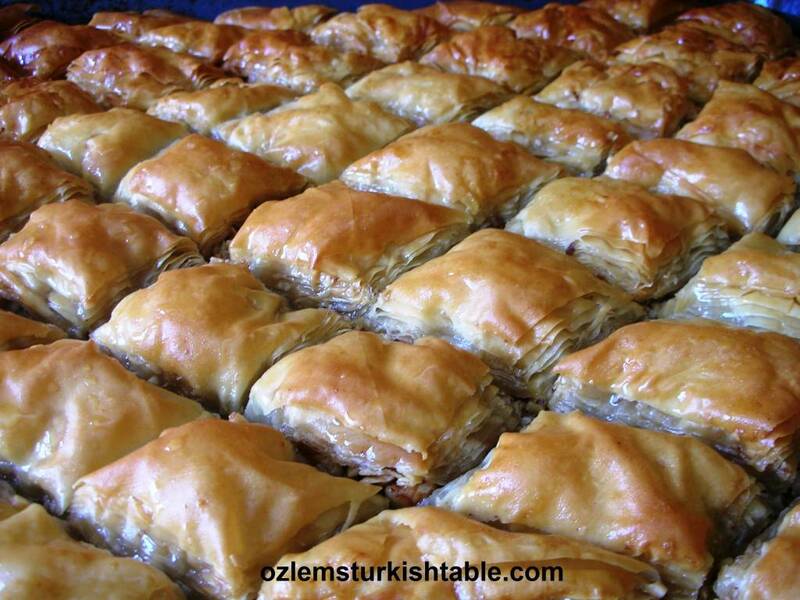 While baklava was baked in the oven, the syrup is prepared, consisting of pure cane sugar, lemon juice and water. In Turkey, there is no honey added in to the baklava syrup. Once cooked, the hot syrup is poured over the relatively cooler baklava, and then baklava tray goes back to the oven for another 5 minutes or so to soak up the syrup. After this, the baklava is rested at a cool area. And here is the real thing; wonderful, melt in the mouth delicious baklava. It is so light that you feel like eating ta plateful! I hope you get a chance to try the baklava in Turkey. 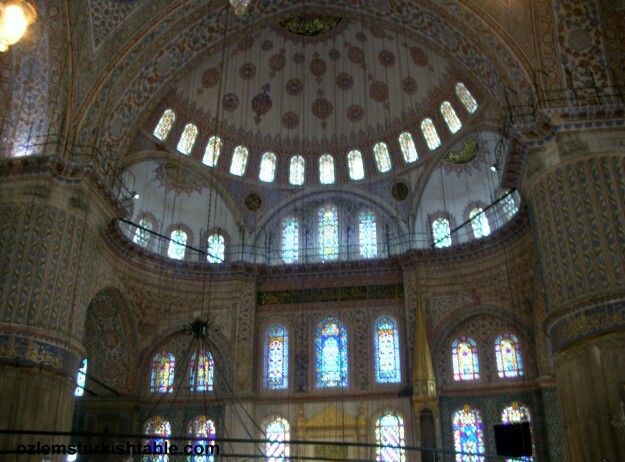 There are many theories as to the origin of baklava; but there is one thing for sure, that baklava was perfected at the Topkapi Palace Kitchens during the Ottoman Period and it was the Sultans’ favorite dessert. The importance of baklava at the Palace was not only because it was accepted as the token of wealth and sophistication ( as in the mansion houses) but also because it was a State tradition. The baklava parade that started at the end of the 17th century or at the beginning of the 18th century is example of this tradition. When soldiers were getting their trimonthly pay from the Sultan, they were offered a big feast and on the 15th day of Ramadan they were treated to baklava. On the 15th day of Ramadan when the Sultan visited Hırka-i Serif (the cloak of Prophet Mohammed kept in Topkapı Palace) as a Caliph , baklava from the palace was sent to the Sultan’s Janissary soldiers. It was one tray of baklava for ten soldiers. The delivery of baklava to the soldiers and carrying the baklava to the barracks had then became an imposing parade. When you place a fork into a baklava you should hear a rustling sound. This means that the thin layers of dough are really thin and baklava is well cooked. The thinner the layers of dough the better the baklava. When you lift to your mouth, you must smell the butter and the nut or peanut used as a filling. A good baklava should have fine ingredients. You can feel the good baklava in your mouth. 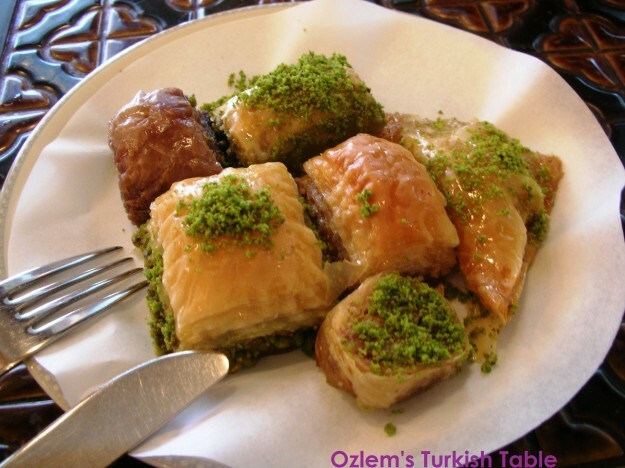 Good baklava leaves a heavenly taste in your mouth and does not hurt the stomach. 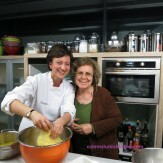 I hope all these inspire you; would you like to have a go at making baklava at home? I make it with filo pastry sheets; it is easier than you think and very satisfying. My version is a little less sweeter and fragrant with a touch of lemon taste, here is the recipe if you would like to have a go. The real thing shouldn’t be very sweet and heavy; on the contrary it should be light enough to tempt you to eat a small plateful. I think this version achieves that. I will be demonstrating how to make baklava at my next Turkish Cookery class, at Central Market Cooking School, Austin – Texas on 2nd August. 9th July marks the start of the holy month of Ramadan this year; best wishes to all observing Ramadan; Ramazaniniz Mubarek Olsun. Baklava is one of the traditional desserts enjoyed during Ramadan, I hope you enjoy this special treat and have a chance to make it at home.